"Coaching" in collegiate cycling is a term with wide meaning, covering the range from full time varsity program managers, to team fitness advisors, to alumni just trying to keep clubs on track. While there are a number of successful, fully student run clubs, many teams can and do benefit a great deal from having at least some external guidance. 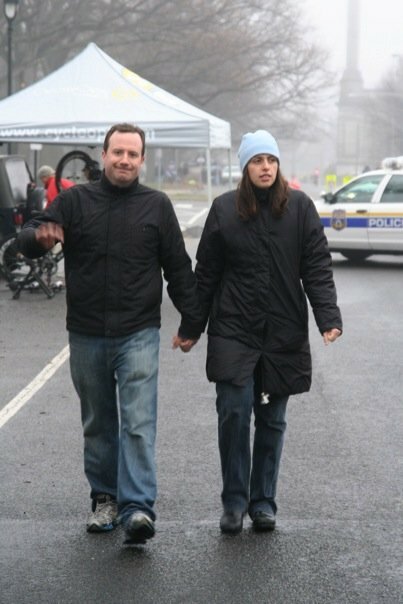 Rob and Samantha Rowan brave the elements for yet another weekend directing the Columbia University team. 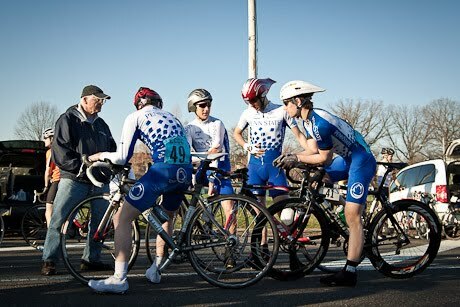 A key point is that "coaching" in cycling is most often associated with helping individuals or groups train. The primary role of this type of coach is to create and monitor training plans, conduct fitness tests, teach technique and form, and generally help athletes build fitness and meet their goals. 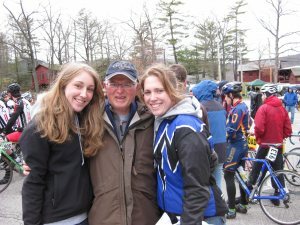 Another form of "coach" common in collegiate cycling is that of a club manager, overseeing a team and its program. This role focuses on ensuring transportation, lodging, and registration arrangements are made, club budgets are in order, and other administrative requirements are met. It may also involve directly overseeing race weekends and traveling with the team. Numerous combinations and degrees of those two roles are possible and exist. Many ECCC athletes have personal coaches, but many teams also have coaches that provide group training plan outlines and guidance. Essentially all teams are required to have faculty or staff advisors providing at least minimal oversight of club activities, but many also have coaches directly involved to a greater or lesser extent in day-to-day operations. Many coaches do not travel with teams at all or attend only local races, while others come out week in and week out; some institutions require that teams travel with a coach. Regardless of focus, most ECCC coaches are essentially volunteers. Some fitness instructors are paid coaching fees, and many that travel extensively with their teams receive gratuity stipends, but almost all are involved simply for the love of it. That said, there are few investments teams can make that have higher returns than engaging effective coaching of either form. Within the ECCC there are currently no varsity teams or full time club coaches. However, there are certainly the building blocks of establishing such a program, as has been done in other regions. Highly motivated individuals interested and serious about building such a program should contact conference leadership and begin networking to gather ideas and support. Find teams in your area and their current contacts, linked from this list of currently active clubs in the conference. We are currently trying to establish a forum for coaches to ask questions, discuss best practices, and generally coordinate to fill the ECCC with the best teams around. To join the discussion, sign up for the mailing list now! Many coaches also officiate throughout the year. If nothing else, this is a great way to ensure a good grasp of all the rules, as well as to gain a deeper understanding of both racing and races.